The DFW Contest Group announces the 2014 "W5" Contest Forum to be held on Friday, June 13th in conjunction with Ham Com at the Plano Center in Plano, Texas. The cost for the Luncheon is $20 and includes admission to the first hour presentation with special guest Ward Silver, N0AX as well as a Deli Sandwich with condiments, potato salad, deli chips, cookie, soft drink and mint. Admission price also gives you a chance to win one of our several door prizes. Seating is limited to 200. Tickets must be purchased in advance using the information below. There is no charge for the remaining 8 hours of presentations and all are welcome to attend. Ward Silver was first licensed at age 17 in 1972 as WN0GQP. He upgraded to Extra and became N0AX in 1975. Ward is a Contester, DX'er and a member of the DXCC Honor Roll. He is currently President of the YASME Foundation, contributing editor to ARRL Magazine, was named by Dayton Hamvention as 2008's Amateur of the Year. 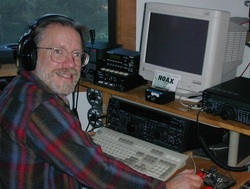 Silver's award nomination cited his "many contributions, including Ham Radio for Dummies, his first effort to show that becoming a ham does not have to be a difficult challenge. His additional books, magazine articles and his "Hands On Radio" column in QST have all helped many hams develop their knowledge and skills." Silver was awarded the ARRL's Bill Orr, W6SAI, Technical Writing Award in 2003. He is also the editor of the "Contester's Rate Sheet" and the ARRL Antenna Design Course. Silver has also written feature articles and product reviews for QST and pens the "Contest Corral" column in the journal.